To all of our CST Friends, Happy 2007 EST! Seeing as how all of you are living in the past, I wanted to let you know us here in the future are enjoying world peace, flying cars, HOVERBOARDS, and all that other stuff from Back to the Future 2. I hope that all you CST people, when you celebrate the ball drop, don’t screw 2007 up for the rest of us. When I think of the Muppets, I think about good quality children’s TV. However, in the 1960’s when people saw the Muppets they thought about Wilkins Coffee and cartoon violence. Watching the commercials I clicked to on YouTube today it is hard to believe you would get away with many of them on TV today, expecially if it was the Muppets. Keep in mind these are the the early Muppets (so don’t expect to see Kermit, but one character is strangely familiar), they are however Jim Henson creations. There are many more of these videos up at YouTube here. 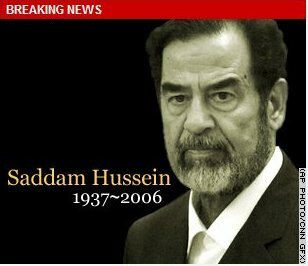 As I am sure you have all heard Saddam has been convicted and executed. I am sure there are a ton of posts out there where people are giving their opinion on this news, I am not going to do that. What I found interesting was how the 3 internet news outlets I read chose to report the news. I don’t really feel the need to comment on the headlines, I just thought it was interesting how with just a web banner from three “news” sites can give three distinct impressions on the news they are reporting. Every year the United States National Film Preservation Board places 25 films onto the National Film Registry. These films are meant to represent “culturally, historically, or aesthetically significant films”. The films on this list are preserved by the Library of Congress and are meant to be a history of film for future generations. If you are like me you notice two things about this list. First, there are many films that I have never heard of (in my defense IMDB hasn’t heard of some of them either). Second, 10. “Groundhog Day” (1993). I have to say it is very comforting to know that in 3006 our great great great great grandchildren will be able to watch a fully preserved copy of “Groundhog Day” and in doing so get a better understanding of how we lived and what we were entertained by. It is a little confusing why we need to preserve a film that you can’t seem to escape in February on Cable, but I guess that is the point. I just can’t wait until the next time I get into an argument about the greatest films ever made and can actually make a legitimate case for one of my favorite movies. We have made the second portion of our Holiday trip from Ohio to Michigan to visit my family. This was the shortest drive of the trip, short 350 miles (about 5 hours). My parents have our trip pretty much planned out for us, so again I wouldn’t expect too many entries. Also, seeing as how I missed doing so Christmas day, Merry Christmas to all! I should start this by saying that I don’t really enjoy reading, I understand that it is an important mental exercise that we should go through to help keep our minds young and sharp. However, in my day to day life reading just seems, well, boring. There are so many more efficient ways to transmit information to our brains, reading seems archaically slow. So it is only during times of vacation that I seem to find the time to read. I must admit when presented with a few hours of riding as a passenger in a car, or a few nights in a bedroom with no TV, reading becomes a much more interesting and welcome prospect. It is with that mind set that I review my latest read, “The Devil in the White City” by Erik Larson. I picked this book up in Chicago (yes another vacation) while Amber and I were going on the first phase of our Honeymoon. I mention this, not because I am sure that it will be important for me to remember later when I have an argument with Amber about our honeymoon purchases but because Chicago happens to be the setting for Larson’s Non-Fiction Novel. The novel is split between two stories both taking place around the Worlds Fair in Chicago back in the 1890’s. The first story tells about the fair itself, how Chicago lobbied for and eventually won the right to host the fair and the stories of the men who helped build and run it. This half of the story is filled with interesting facts about the fair and Chicago. It presents the notion of how enormous the task of building “The White City” was and how it could have gone wrong many times. It was truly impressive to me that based solely on civic pride a group of people could raise an entire city in a couple years, only to have it destroyed soon after. It is hard to think that any American city could do the same today. 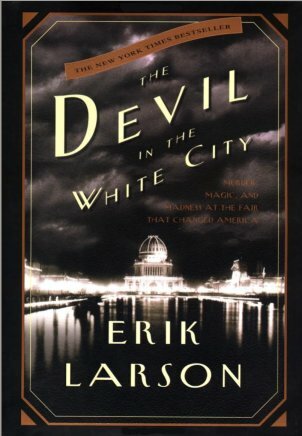 The “Devil” in this White City refers to a Serial Killer that walked the streets of Chicago around the time of the fair. This part of the story was especially interesting because it showed how innocent America was during this time. The idea that someone would kill for no reason was so foreign that it didn’t even occur to the Police. This part of the story also shows how disconnected everyone was in the 1890’s. The killer would not have been able to do anywhere near what he did in todays world (His credit score alone would have stopped many of the murders). That idea is comforting, what is not comforting is that killings that seem common place today were enough to cause national headlines and outrage in the 1890’s. Where, Holmes (the killer) was an oddity of his time, we have seen many more serial killers since that proved to be far more deranged. Overall, this book was a very interesting read. Though it is technically non-fiction it reads like a novel, and was interesting enough to keep this casual readers short attention span. Larson does a good job of keeping the story moving and not getting bogged down in the details. This is not the complete history of the Chicago Worlds Fair, but it touches on the high points. The fault I found in the book was the lack of suspense. I never really felt that connected to the victims, Larson did a good job of setting them up as innocents, and a better job of setting Holmes up as “creepy” (Amber’s word), but the victims never stayed around long enough for me to get attached to them. This hurt the feeling of suspense when Holmes would stalk and court his victims. Parts read much more like a Dateline NBC special then a good thriller. That being said, I would recommend this book to anyone that enjoys history and/or mystery/crime novels. The book can be purchased from Amazon here. We made the first part of our Christmas 2006 trip, going from Rochester to Dayton (according to Google Maps about 650 miles). We are in Dayton for Christmas with Amber’s family and will be spending New Years in Muskegon with my Family. One of the joys of having started in a long distance relationship is that now we have to drive a lot to see both familys over the holidays. I remember when I was growing up my mom would make paper cuttings. I think the art form had some fancy name, but she would spend hours with very sharp scissors cutting very intricate designs into a piece of paper. My mom hasn’t done a cutting in a very long time, but it is cool to see that the art form has continued to evolve. Check out more pics here. Oh Wikipedia, what don’t you know. This is a collection of paradoxes, some of them seem kinda stupid, but some are kinda cool. I kind of like the Unexpected hanging paradox because I could see myself using the same logic if I were in the same situation. The full list is here. Oh and well looking at the site I found this video combining the two musical geniuses of our time; yup that’s right American Idol’s Taylor Hicks and Weird Al. Watch it here. © 2019 ADAM & AMBER ASLAKSON. ¶ Thanks, WordPress. ¶ Nice XHTML & CSS.